While I generally enjoy them, Double/Imperial IPAs aren’t my favorite style. Stone SoCal Hop Salute Black Double IPA also embodies two trends in craft beer right now: Black IPA and Citra hops. I don’t have anything against Black IPAs as long as they’re enjoyable. Citra hops on the other hand aren’t my favorite. Many people love Citra, they’re just not for me. Thankfully I looked past my biases because I really enjoy this beer. The Citra hops are kept in check, there’s a bit of citrus bitterness but it’s not overwhelming. SoCal Hop Salute Black Double IPA really blurs the line between Double Black IPA and Hoppy Imperial Stout, I don’t think I would object to it being classified in either style. 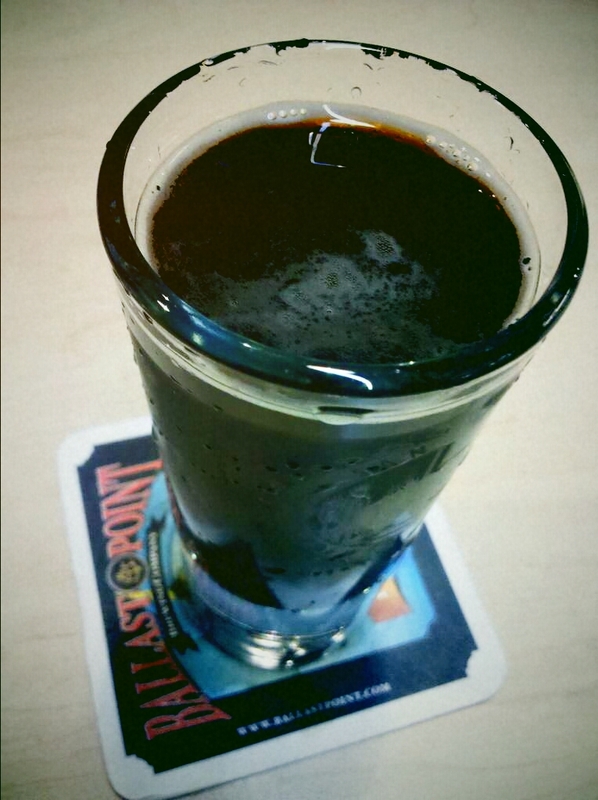 It’s as black as most Imperial Stouts with a citrus hop smell and just a hint of roasted malt. The taste starts hoppy with some citrus then transitions to a more roasty bitterness before a more earthy hop bitterness covers the taste buds and lasts quite a while after swallowing. The beer finishes dry leaving me reaching for drink after drink. 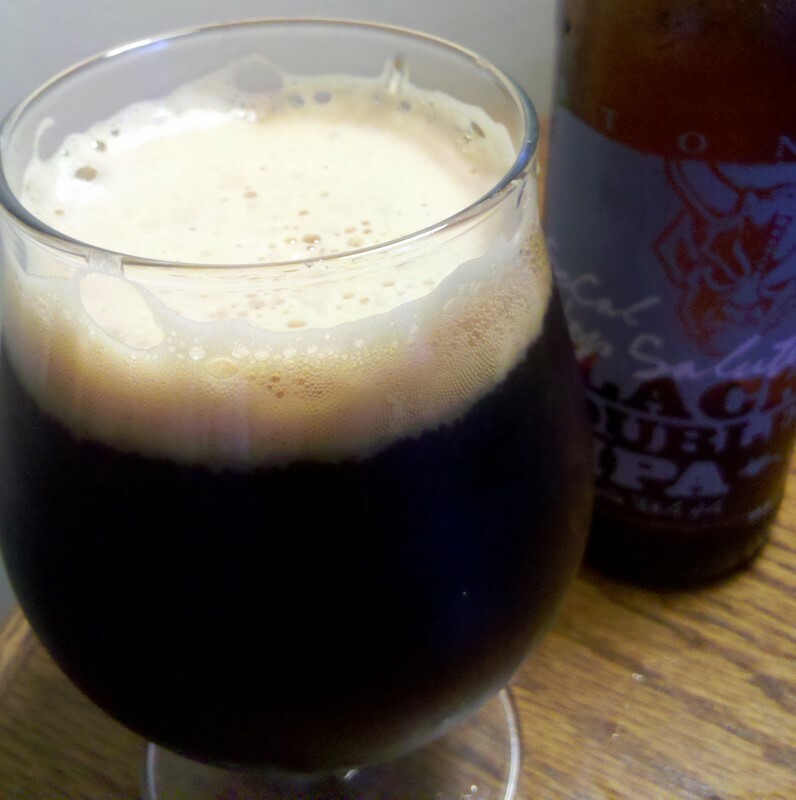 Stone SoCal Hop Salute Black Double IPA is listed as 9.9% ABV and 110 IBU but its surprisingly easy to drink. Sadly this is my first, and probably last time ever having this beer. It was one of three commemorative beers given away at the National Homebrewers Conference. Later this summer Stone will release their 15th Anniversary beer, Stone Escondidian Imperial Black IPA, which reportedly will be similar but not the same beer. No write up of events this week, I’ll hopefully get back into the swing of things and post the weekly curated list next week. For now check the calendar below (if you’re on the main page click “read more” below or click here). And whatever you do make sure to safely enjoy the holiday weekend. 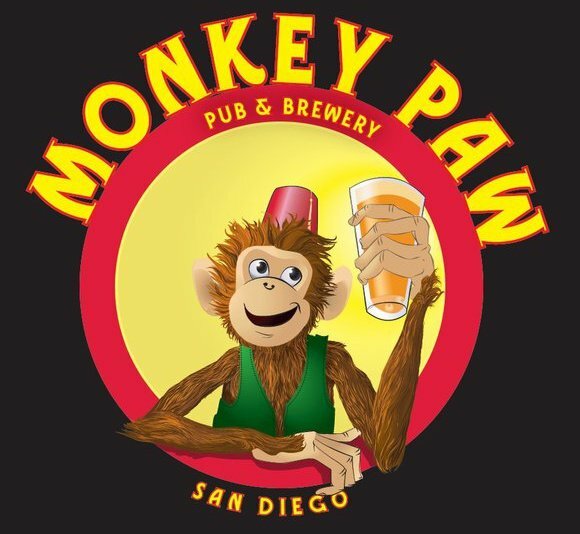 Posted by Jeff Hammett in alesmith brewing co., beer festivals, breweries, green flash brewing co., karl strauss brewing co., lost abbey, pizza port carlsbad, pizza port ocean beach, pizza port solana beach, port brewing co., stone brewing co. The results are in from last weekend San Diego International Beer Festival competition and this year Pizza Port Carlsbad’s Poor Man’s IPA took home the gold medal for Imperial IPA’s as well as the best in show top honors. This marks the third year in a row that a beer from one of the four Pizza Port locations has been designated Best in Show. Last year’s Best in Show winner was Big Wednesday, a Belgian style IPA from Pizza Port Solana Beach. 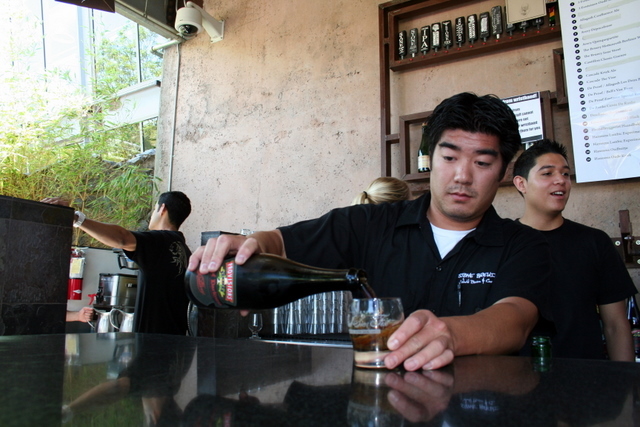 In 2009 Pizza Port Carlsbad received Best in Show for Good Grief Brown Ale (which recieved a Bronze this year in the English-Style Brown Ale category). Plenty of other San Diego breweries took home medals this year. Stone Brewing Co., Tailgate Beer, Green Flash, Karl Strauss and AleSmith all walked away with a gold medal each. Pizza Port Ocean Beach took home two gold medals while Port Brewing/The Lost Abbey was awarded three gold medals (Shark Attack on the Port side and Veritas 008 and Red Poppy on the Lost Abbey side) as well as receiving the most overall medals out of any brewery with six total by my count. Click here for a PDF of the full list of medal winners. Over 100 different sour beers were available at Stone Brewing Co.’s Fifth Annual Sour Fest yesterday at Stone Brewing World Bistro and Gardens in Escondido. Among the 100 beers offered there was good variety of beers that were just barely sour to those that were so tart they made your mouth pucker. Sour beers definitely aren’t for everybody, but you wouldn’t know that from how quickly Stone Sour Fest sold out this year (weeks in advance, no tickets were available at the door). Personally I love sour beers, but don’t have a lot of experience with them. Many can be pretty hard to come by and often rather expensive so there are a lot of well known and classics as well as obscure and limited release sours that I’ve never had before. Looking over the list I was excited to try plenty of new beers that I had either never heard of or just never had a chance to try before. Cantillon, a Belgian brewery founded in 1900 is well known around the world among beer geeks for their sour beers, and they hardly ever make it to San Diego, so plenty of people were excited to sample their offerings. From what I’ve been told Cantillon Cuvee des Champions was the first beer at the fest to run out, one friend said it was gone by the time he got there at 10:10am, 10 minutes after the fest officially got under way. Another much sought after beer was The Bruery’s Sour Cherry Kriek, put on after The Wanderer ran out, word got around the through the crowd and a line quickly formed. I don’t know how long it took for the keg to kick but it didn’t take long, it was marked as empty soon after I got my sample. A few of the standout beers I sampled are below. The Bruery’s Tart of Darkness. This one is around 5% ABV and has some good roastiness in addition to the sour tartness. I think it’s available in 750ml bottles as part of the Provisions series at The Bruery Provisions in Orange. I highly recommend picking some up if you get the chance. Cantillon Iris. One of the classics I had never had before. Quite a bit of funk in addition to the mouth puckering sourness with an extremely dry finish. Craftsman Sour Lavender 2010 and 2011. Both were good but I preferred the fresher 2011. I’m not a huge fan of lavender but I really enjoy this beer. The Lost Abbey Sinners Blend 2010. Bourbon, vanilla and a bit of caramel, this was sweeter than I expected while still being pretty acetic. One of the more heavy beers of the day. The Bruery’s Oude Tart. I absolutely love this beer. Dark fruit, leather, vanilla and oak, this is a beer I could sip on all day. See below for a few pictures from the day. Home Brews and Gardens Brewing Co.? I doubt that’ll be the name they end up going with, but last week Home Brews and Gardens, North Park’s homebrew and gardening supply and ingredients shop on Thorn Street applied for a type 23 small beer manufacturer’s license. Seems like you can’t got a day in this town without hearing about a new craft beer bar, brewpub or brewery opening. Assuming they pass all the scrutiny of the California Department of Alcoholic Beverage Control, getting past neighbor complaints and protests and are issued a license, then they can start commercial brewing and selling their beer. For an area as beer-centric as North Park, the prospect of this, what would be the first brewery in North Park is pretty exciting. It might be fizzy and yellow, but it certainly isn’t for wussies. Green Flash Brewing Co. recently bottled about 400 cases of their Fizzy Yellow Beer, a Bohemian-Style Lager, with the label seen to the left. The beer was rebranded as Chuckvar and described as a “Premium Chuck Lager” and a “Product of the Chuck Republic”. Chuck of course being Green Flash’s brewmaster Chuck Silva and the label paying homage to (or a parody of?) Czechvar. Green Flash CEO Mike Hinkley tells me the packaging came as a surprise to Silva and that about half of the cases were given as gifts to employees. The rest he tells me will be available at Green Flash’s tasting room. “We are in this business to make great beer and have some fun. This accomplished both,” Hinkley said. I have to say I certainly agree. Click through to see a picture of the original Czechvar. This beer is like no other beer I’ve ever had before. Brewed with madras curry, caynne pepper, cumin, toasted coconut, and kaffir lime leaf, Indra Kunindra is a 9% ABV stout brewed in collaboration with homebrewer Alex Tweet. Indra Kunindra was the winner of Holiday Wine Cellar’s 2nd Annual Homebrew competition last year, which is why it was chosen to be brewed at Ballast Point and I believe it is Ballast Point’s entry for the Pro-Am competition at the National Homebrewers Conference going on in Mission Valley right now. Indra Kunindra smells like walking into a highly aromatic Indian food restaurant. It smells like a plate of curry was set down right in front of me. The taste is much the same, I tasted cumin and coconut and a bit of citrus which I can only assume was the kaffir lime leaf. I felt the heat from the cayenne pepper soon after I finished my first sip, but it wasn’t an unpleasant heat. The beer felt much thinner than I expected from a 9% ABV stout, but that isn’t a complaint just an observation. The four ounce taster, which cost me a dollar plus tax at Ballast Point Linda Vista/Homebrew Mart, was probably just the right amount of this beer that I would want to drink in one sitting. One friend told me the aftertaste lingered unpleasantly for quite a while, which I didn’t experience but I could easily see that happening. As soon as I took my first sip I did immediately wished I had some food, something like a garlic naan bread. This is a beer that seems like it was made to go with food, but you would have to be careful to find the right combo where the beer wouldn’t overpower the food. The June issue of West Coaster has a recipe for a scaled down version of Curry Stout that looks to be very similar to this one as well as a recipes for Prawn Curry with Fresh Pineapple & Asparagus and a Curry Paste courtesy of Ballast Point’s Specialty Brewer (the brewer that collaborated with Tweet on this beer) Colby Chandler.